Qualcomm's Snapdragon is one of the most popular smartphone chipsets around and it's the basis of both the Sony Xperia Z and the HTC One. There's an important difference though. The Xperia Z uses Snapdragon S4 Pro, while the One uses Snapdragon 600. The S4 Pro uses four classic Krait cores clocked at 1.5GHz, while the 600 uses four Krait 300 cores at 1.7GHz. The two versions of Krait are similar, but the 300 has several speed tweaks that make sure it's doing better even when clocked at the same speed as its predecessor. Both chipsets use Adreno 320 GPUs but there may be a difference in clockspeed. There's certainly a difference in clockspeed for the CPUs though. 200MHz in favor of the HTC One might not sound like much, but in combination with updated architecture should give it quite an edge. It shows pretty clearly in BenchmarkPi, a single-threaded benchmarks. Some multithreaded workloads may not care much for the difference between chipsets (Linpack), but others do (Geekbench 2). 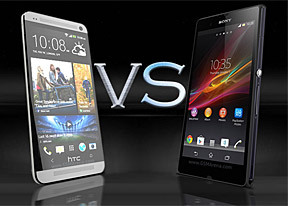 Overall, you can expect the HTC One to be slighlty faster than the Xperia Z is CPU-heavy tasks. AnTuTu and Quadrant test the whole system - CPU, GPU, RAM, storage - so the lead of the HTC One widens here. But how much of that is due to a difference GPU performance (because of a higher clockspeed)? Well, GLBenchmark 2.5 Egypt (the 1080p off-screen test) showed the difference is quite significant and in favor of the HTC One (6fps or about 17% faster). Real-world games might not show a difference for a while though. Epic Citadel is a tech demo for Unreal Engine, which has been used in many high-end 3D mobile games and the benchmark mode often hit the software 60fps limit on both smartphones. The HTC One uses the stock Android browser and comes with Chrome preinstalled too, while the Sony Xperia Z has Chrome as its single web browsing option out of box. We used the stock browser on the One and Chrome for the Xperia Z benchmarks as we believe those are the default browsing options on the two smartphones. The HTML5 benchmark, Vellamo, also puts the two phones close together (closer to the top this time) with an advantage for the One. Winner: HTC One. This was an easy win - the One beat the Xperia Z in every category (though often by small margins). The Sony Xperia Z is by no means a slouch, it just uses the previous generation of the chipset and has lower clock speeds.